Cupcakes…everything about them makes you smile. They are your own little cake, super sweet and, portion-controlled, so you will eat just the right amount. I made these cupcakes for my mom this weekend in light of the news that she was diagnosed with breast cancer. It is very difficult to be 3 1/2 hours south with a busy schedule when you hear news like this. However, we were planning to come home this weekend anyway, so I just did what I had to do to get here early. I also like bringing something home, and I thought that this occasion warranted something sweet and delicious that I knew my mom would love. They were a hit and I hope you enjoy them. In a large bowl, add the flour, sugar, and baking powder. Mix until evenly combined. Add the remaining ingredients. Beat on low until completely incorporated. Then beat on medium for 3 minutes. Line a cupcake/muffin pan with liners and fill each 1/2 full (this is important. I filled them 3/4 full, like with muffins, and they rose over the liners!). Bake for 18-25 minutes, depending on how full the liners are. They are tun with the tops are firm and an inserted toothpick come out clean. Let cool 1-2 hours before frosting. In a medium bowl, blend butter until creamy. Add the milk slowly and blend well. Add the remaining sugar and blend on high. Continue blending until it becomes thick. If it does not become thick, add more powdered sugar. If it is too thick, add more milk. Once the desired consistency is reached, add the vanilla and blend well. Taste; add more if needed. 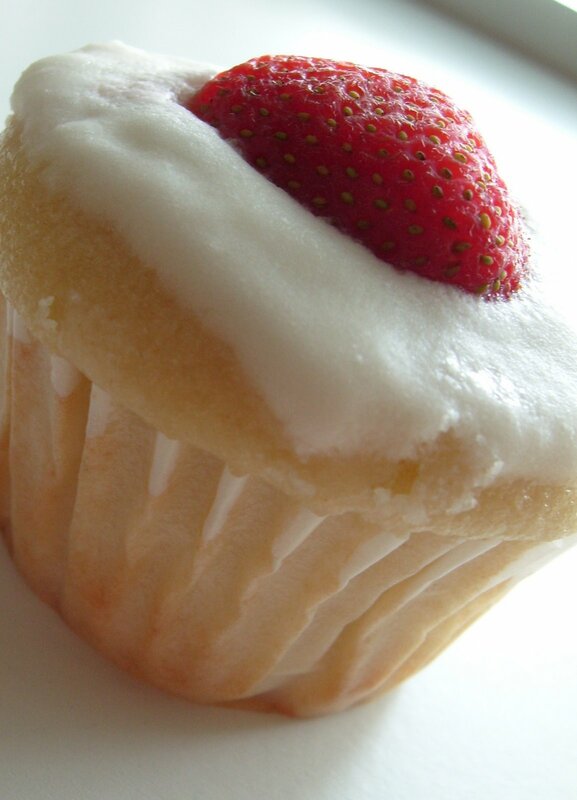 Refrigerate for about 1 hour, or until the frosting looks like traditional “canned” frosting. For the strawberries, hold the paring knife just under the stem of the strawberry and cut around the top at an angle, so only the stem comes off. Slice the strawberry in half from the top to the bottom. 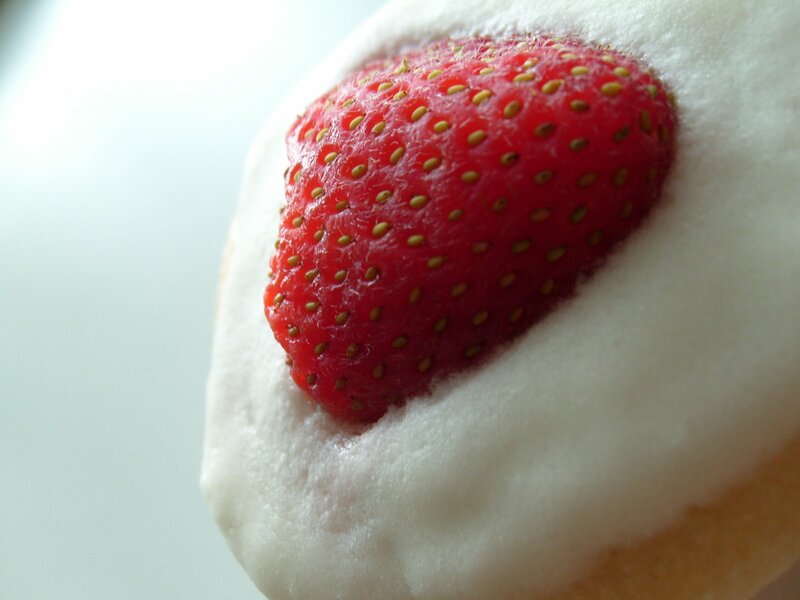 With the paring knife, modify the top of the strawberry to be shaped like a heart. I noticed that using your fingers a little to smooth the edges helps as well. Place 1 heart on each cupcake and enjoy! When I think there is nothing in the house to eat, there are ALWAYS two things: Bread and Cheese. What is more comforting than a good old grilled cheese sandwich? Not much! Jason and I love grilled cheese sandwiches and usually end eating them at least once every other week. We use a non-stick pan, so only a little butter goes a long way. I also make them on the George Foreman Grill for a lighter option. However, they taste 100% different, so if you are in the mood for that crispy, buttery crust, stick to the pan. Butter one side of each slice bread. Place the butter side down in the pan and put the pieces of cheese side by side from the left skinny side of the bread to the right. Place the second slice of bread on top, buttered side up. Let sit about 3 minutes. With a spatula, flip the sandwich over. A little trick…flip from the skinny side, not the wide side. I always flipped from the wide side and it would fall apart. Since Jason has showed me the skinny side flip, they turn out perfect every time! Cook about 3 more minutes. Repeat for 1 minutes on each side, if the sides need more browning. Heat a large skillet to medium-high with the oil in the skillet. Place the zucchini slices in the pan. Let sit about 1 minute and then turn frequently so both sides brown. After about 5 minutes, add the tomatoes and seasonings. Cook until the zucchini are soft and browned. Jason is back home in WI for the at a good friend’s bachelor party, so I am alone for the entire weekend. At first I was so excited about how much school work I would get done. However, the rain has made me want to do everything but school work…laundry, cleaning (including the bathrooms), and, of course, cook. This morning I found a new food blog called Straight from the Farm. Just from the few recipes I looked at this morning, I can tell I will like this one! One recipe was for a corn and tomato bread pudding. I saved this one instantly, because I had some tomatoes sitting the refrigerator getting older by the minute. I also had some zucchini in there with them (are you surprised? ), so I figured I could throw those in as well. Instead of fresh corn I used some frozen corn. I don’t ever have half and half on hand, but I did have some ricotta left from the Eggplant Ziti I made last week, so I figured I could mix it with skim milk to mimic some half and half (or I would at least try). I admit I was a little nervous to try it when it was done, but I was pleasantly surprised that all my substituting and experimenting worked out well! I am excited to have Jason try it tomorrow. In a large bowl, add vegetables and stir well. In a medium bowl, whisk the eggs. Once lightly foamed, add ricotta cheese and whisk until evenly distributed. Add skim milk and whisk until evenly distributed. Add seasonings Parmesan cheese. Spray a 9” square baking dish or similar size dish. Rip up the bread and place on the bottom. Rip enough bread to coat the bottom of the pan (extra if you’d like). Pour the vegetable mixture over the bread. Sprinkle the mozzarella cheese over the vegetables. Pour the egg mixture over the top, completely coating. Bake uncovered for 40 minutes. It is done when an inserted knife comes out clean. Last weekend I was inspired by More than Burnt Toast’s* version of stuffed burgers. 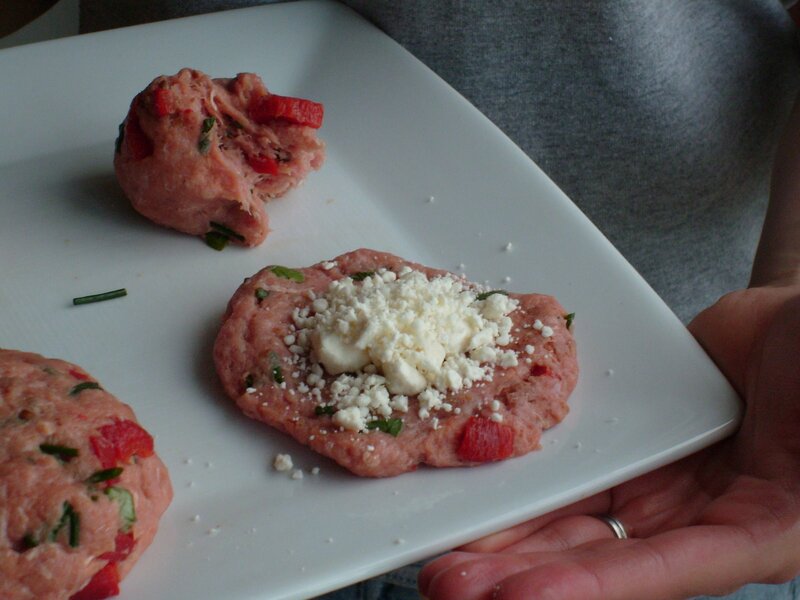 I tried doing mozzarella stuffed burgers once before but they ended up falling a part a little. When I told Jason I was trying them again, he was skeptical, but it was my chance to prove him wrong (as all wives seems to love to do). Thankfully, they turned out great! Jason and I both loved them and I will be making them again sometime soon. In a large bowl, combine all of the ingredients except the cheese and mix well with your hands. 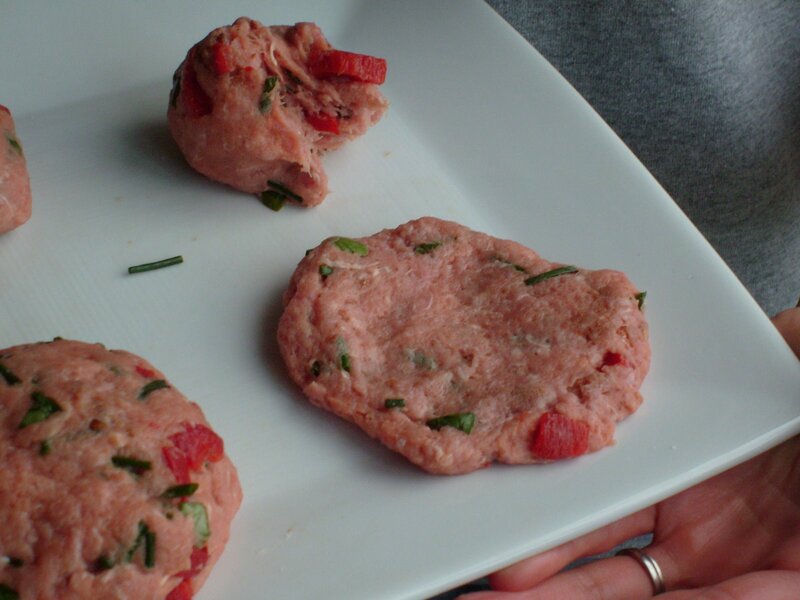 Form the meat mixture into a ball and with your hand, press in a seam down the middle horizontally and vertically to make the ball into 4 equal pieces (this will be the size for each of the 4 burgers. Anything smaller will be hard to stuff, but you can try!). Remove 1 piece from the bowl and split it into two pieces. Flatten one piece out to be about 1/4-1/2″ thick (see picture above). Flatten the second half of the first patty that was reserved on the plate. Place it on top of the cheese-topped patty and push the edges together to seal the seam. Pick the ball up and work it a little to remove any visible seam line. Continue with the remaining burgers. Grill for about 5 minutes on each side, or until the meat reads 165F. Remember, there is cheese in the middle, so you need to only go down about 1″ to read the meat temperature. Back in April, Jason and I really started to notice how expensive groceries had become. Partly due to our new location (surprisingly, they consider DeKalb a suburb of Chicago; this lets businesses jack up prices, making out cost of living much higher than NE Wisconsin) and partly due to the rising cost of groceries. One item we seemed to consume a lot of was bread. Being a nutrition guru, I enjoy a nice, nutty, healthy piece of WHOLE wheat bread*. Sadly, one loaf of the bread cost $3.89 at the local grocery store. We would go through nearly 1 1/2 loaves per week, making out cost about $5 per week just on bread. To solve the problem, we decided to invest in a bread maker. It has already paid for itself! While the recipe I normally make is not 100% whole wheat, it is delicious! I also feel like the simplicity of ingredients and lack of preservatives makes it worth the those 1 or 2 grams of fiber I am missing out on. There is a whole wheat recipe, but it seems to dry out within 2 days. I will post some more bread recipes as I try them. -Pour the wet ingredients, in order as listed, into the bread machine. -Sprinkle the salt over the top of the wet ingredients. -Add the bread flour. Follow with the whole wheat flour. -With your finger, make a small well in the flour that the yeast can fit in. This is very important, because the yeast is not suppose to come in contact with the water prior to starting the bread maker. -Pour the yeast into the well. -Insert the bread pan into the bread maker and bake on the Whole Wheat Setting. I prefer the light crust, since the wheat bread seems to get too hard if I use the medium or dark crusts. Ours takes 3 hours at 40 minutes. -Our bread machine makes tall loaves (as you can see above). I can not seem to cut these without the insides ripping and I do not feel like I need a slice of bread that is really 1 1/2 slices of store bought bread. To solve this problem, I cut the bread in half lengthwise and then slice it. The pieces range for 1/2 to 3/4 the size of regular store bought bread slices, but they cut much easier! companies are allowed to call bread “wheat bread” when they use “white flour.” Most people who are looking to buy wheat bread are actually interested in “Whole Wheat Bread.” In order to call a bread “whole wheat” it needs to be made with 100% wheat flour (unbleached and unenriched; this means all of the naturally occuring nutrients in wheat and its fiber are still intact). at flour, so I beleive it would be a much more nutritious option than other “made with Whole Wheat Flour” breads.Why do I think this? First, as I said above, there are no preservatives or added ingredients; just what is needed. Second, if you read a food label, the first ingredient is the more predominant ingredient by weight. Almost always, “made with Whole Wheat Flour” breads have “enriched wheat flour” as the first ingredient and the Whole Wheat flour is further down the list. Although in my recipe the whole wheat flour and bread flour are in equal quanities, I am 99% sure the Whole Wheat flour would go first, since wheat flour weighs more than bread flour per cup. Personally, I am not a fan of eggplant. I try, I really do, but I can’t seem to enjoy anything I have ever made with it. 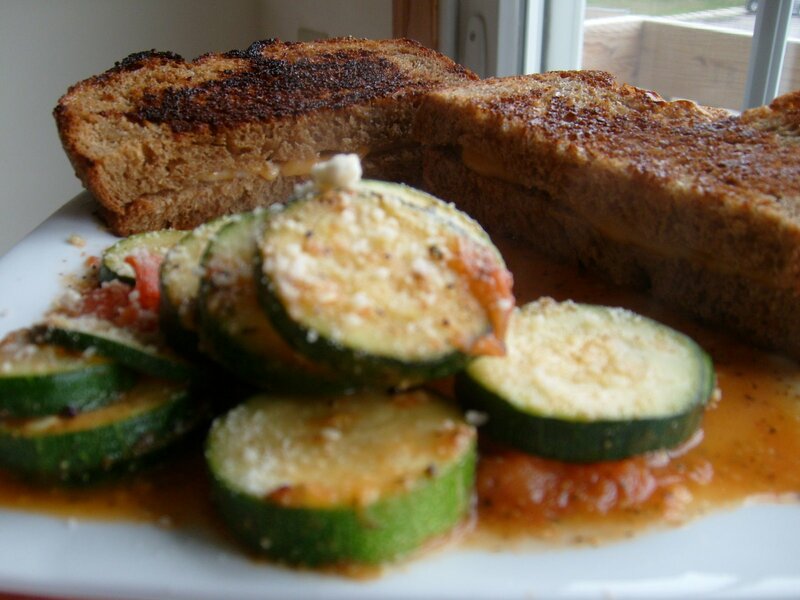 I usually end up substituting zucchini for it in dishes like this. However, I figured I would give it my annual late summer try. Overall, the dish turned out pretty good and the eggplant was palatable (The dish would be great without it). If you like eggplant and Italian food, you will enjoy this recipe! Break up tomatoes in a large bowl. Stir in ricotta cheese, onion, and seasonings. Spread pasta mixture and layer cheese on top. 1. Cook (I would sauté for flavor) the eggplant prior to adding to the casserole. 2. Cover the dish and bake for 30 minutes. Remove the foil and bake until the cheese is lightly browned. 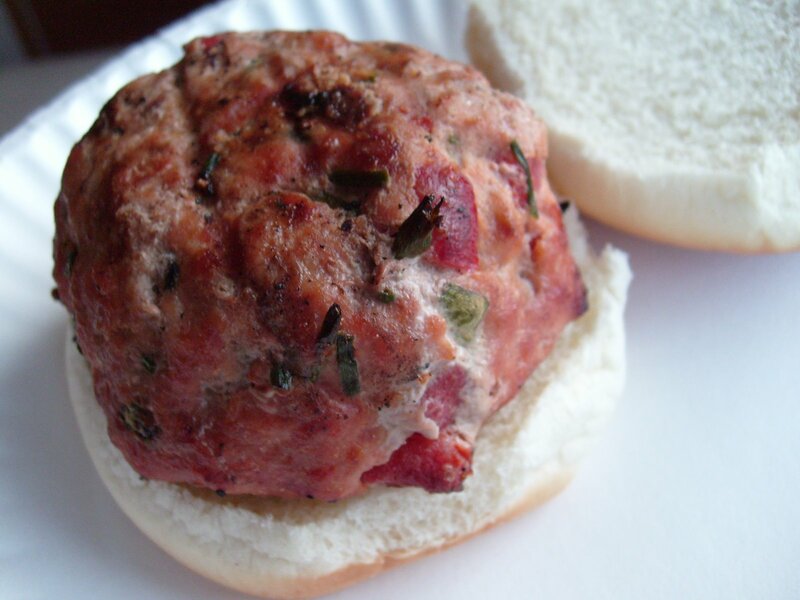 People often think that beef and other ground meats are “bad” for them. First, I would like to challenge everyone reading this to not call foods “good” and “bad.” No one food is going to kill us and no one food is going to save us. When that one food is discovered, then I think the dichotomous thinking of “good” and “bad” can be used. Instead, we could use words like, “less healthful” and “nutritious.” I think these words (much more than the latter) promote thinking of food as food and encourage the possibility of a diet that includes all foods, in moderation. 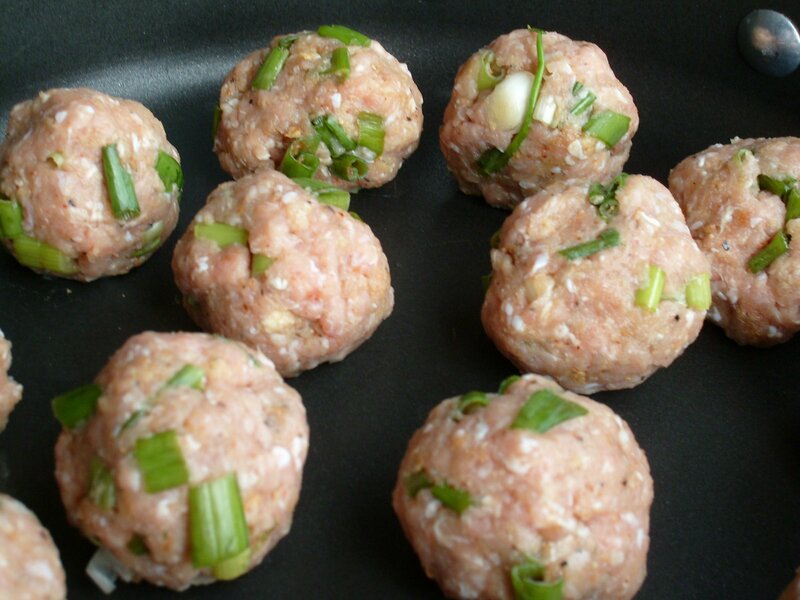 Regardless, ground meat, while it tends to be high in fat, is a great choice of a few dinners each week. It is filling and provides important vitamins and minerals, some of which include B12, iron, zinc, and B6. If you are going to chose beef and other ground meats for meals, I would strongly encourage you to purchase the leaner varieties (90% lean or higher) if possible. Shape into 10-20 balls. Try to keep your hands wet to preventing sticking. Fry in a pan for about 10 minutes, or until the temperature reads 165F. 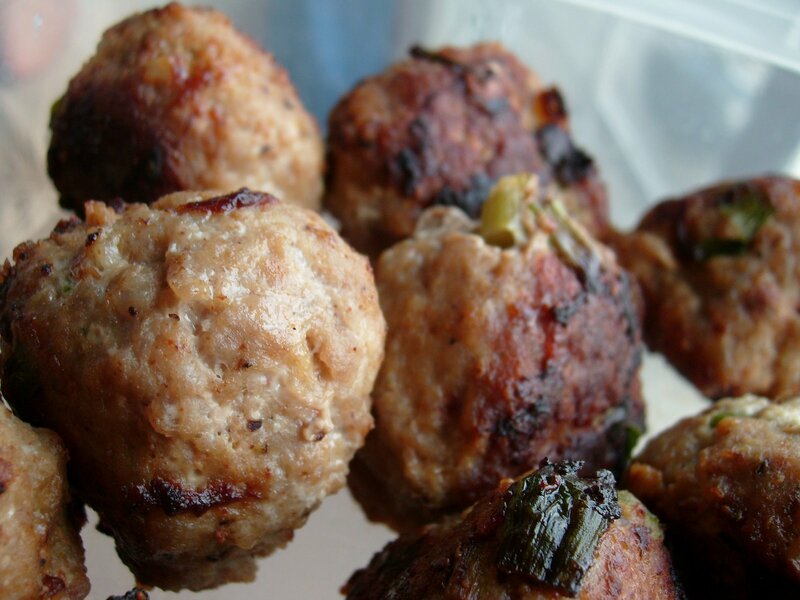 Be sure to continuously turn the meatballs until they are browned on all sides.